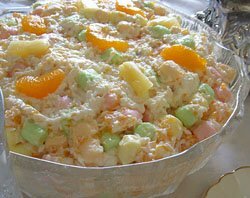 Ambrosia fruit salad is an easy salad recipe that can be made in minutes. I love this dish to bring for a family Easter Buffet or a summer time picnic. Thank you Karen for such a wonderful recipe that I use throughout the year. The fun thing about this salad is you can use your imagination. Change the fruit and make it a tropical fruit salad, or use whipped cream instead of sour cream and serve it for dessert. Mix all and chill for an hour before serving. For a light version, substitute with light sour cream or fat free plain yogurt. Easter or Spring variation: Use pastel colored marshmallows.